Sleep and Neurologic Disease reviews how common neurologic illnesses, such as Parkinson’s Disease and Alzheimer’s dementia impact sleep. 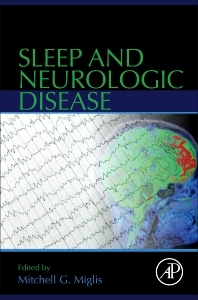 In addition, the book discusses how common primary sleep disorders influence neurologic diseases, such as the relationship between obstructive sleep apnea and stroke, as well as their association with various primary headache disorders and epilepsy syndromes. The utilization of sleep technology, such as polysomnography, multiple sleep latency testing, actigraphy, laboratory and CSF testing is also covered. The book is written for the practicing neurologist, sleep physician, neuroscientist, and epidemiologist studying sleep. Dr. Miglis is Clinical Assistant Professor of Neurology and Neurological Sciences and Clinical Assistant Professor of Psychiatry and Behavioral Sciences at Stanford University. He completed fellowship training in autonomic disorders at Harvard Medical School and sleep medicine at Stanford University. He is board certified in neurology and sleep medicine and serves on the sleep medicine section committee for the American Academy of Neurology. His clinical interests include the overlap of sleep and neurological disease, and his research focuses on autonomic impairment in sleep. He is a firm believer that good health begins with good sleep, and that the complete treatment of any patient with a neurological illness should include a thorough understanding of how their illness impacts the quality of their sleep. We all know that sleep is important. It was disturbing to me to read about how abnormal sleep can cause heart attacks, stroke, and other serious illnesses. The chapter on sleep and stroke is really eye opening!